Microwaves are commonplace in most homes in America. Whether you use this handy appliance for popping corn, reheating leftovers or to prepare an entire meal, you need to clean it regularly. 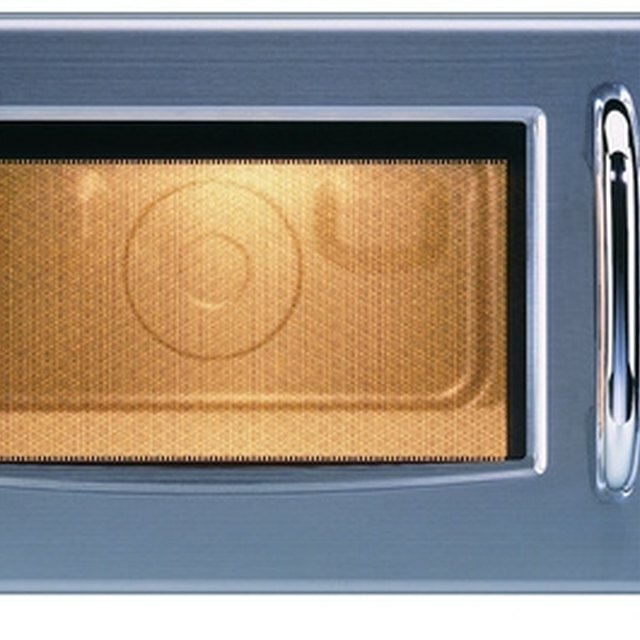 Dirty microwaves result in damage to the microwave, offensive smells and other hazards. Keeping this appliance clean takes little time if you wash up the spills and food residue immediately. A buildup of food residue may cause a fire in your microwave. Microwave ovens heat up food and liquids with high frequency radio waves. Since foods items contain moisture, the food readily absorbs the energy of the waves, thus resulting in the microwave heating the food. The microwave energy must be contained inside the appliance or the microwaves may be absorbed through body tissue, such as the eyes and testes -- although rarely is a body part exposed to microwave energy long enough to cause harm, according to the World Health Organization website. Microwaves are safe as long as the energy is contained in the appliance. If the door is working properly, the microwaves stay inside the unit and and the power is released only when the door is shut tight. Buildup of food particles and hardened residues don't allow the doors to shut efficiently; therefore, leakage of the microwaves results. A dirty microwave heats up spills and food residue each time the power comes on, which results in an offensive odor emanating from the appliance that may cause headaches or nausea in individuals who are sensitive to strong odors. Buildup of food residue may catch on fire if the microwave is on high or in use for only a few minutes. Regardless, the continued heating of the food residue continues to harden it and make cleaning the food off the microwave more difficult, thus providing an unsanitary area to prepare foods. Covering your dishes during the cooking process to prevent splatters is helpful. Likewise, place a paper plate or a microwaveable dish under foods such as a baked potato to keep the glass turntable or bottom of the microwave clean. Don't ignore spilled liquids or other foods; wipe them up as soon as they occur. Regular cleaning with a sponge dipped in a soapy solution of warm water and a mild dishwashing detergent helps prevent food residue buildup. An effective trick to cleaning the appliance is to boil about a cup of water in the microwave for a few minutes to release steam. Adding about 1/4 cup of lemon juice to the water is an effective way to eliminate any offensive odors. Simply wipe out the moisture with a damp sponge. Keep the door seals and interlocking devices clean by wiping regularly with a damp sponge to ensure the door closes properly.